This video is part of the Greater Sudbury Food Strategy Report Progress Report. It highlights just some of the amazing food initiatives happening throughout Greater Sudbury. Thank you to ReThink Green for pulling this and the infographic together. In 2017, the Greater Sudbury Food Policy Council released the Greater Sudbury Food Strategy. It includes actions related to healthy food, growing food in urban areas, forest and freshwater foods, food retail, and agriculture. The Greater Sudbury Food Policy Council is hosting the fifth-annual Four Minute Foodies event on Wednesday, February 13th in Board Rooms C and D of the Provincial Building at Tom Davies Square, from 12 to 1 pm. This event features several Sudburians who are making a difference to the way food is grown, distributed, and consumed in Greater Sudbury. Each presenter will speak for four minutes, about how they or their organization is making positive change to Sudbury’s Food System. The Greater Sudbury Food Strategy Progress Report will be launched at this event. Click here to register for your free ticket on Eventbrite! Local foodies, business owners, activists and elected officials gathered over the lunch hour to hear seven local changemakers talk—for just four minutes each—about how they are creating positive change to our city’s food system. Some new voices were featured at this fourth-annual Four Minute Foodies event, sharing stories about the changing food landscape. Jolene Recollet spoke about Wahnapitae First Nation’s new and ongoing food programs. “I look forward to starting conversations about integrating Indigenous Food Sources into Greater Sudbury’s Food Fabric,” said Recollet, an Economic Development Officer for the community. The audience of City staff, elected officials and food activists were treated to a preview of La Fromagerie’s new menu and fresh look, by new owner, Kelsey Cutinello. “We have kept the best of the old and put in some of our own flavour. We are very excited to share our passion with Sudbury!” La Fromagerie will be carrying local food products when it re-opens February 20th. 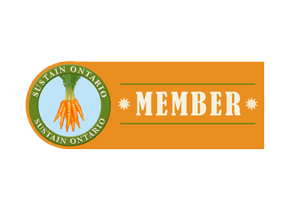 Erica Lagios, General Manager of Eat Local Sudbury, spoke about the recent decision to close the co-op and shared some ways that eaters can still access the local produce, meat, and other goods they have come to love. “Our team would like to maintain the relationships we’ve created with local farmers over the years, and invite the community to visit the Coalition for a Livable Sudbury website to find the latest information on other retailers that carry their products, as well as contact information to reach out to our producers directly.” Interested people can also sign up to receive information about local group buying initiatives here. The lunch-time audience also got a sneak peak into the Culinary Tourism Strategy which is currently in development. Dana Jennings, Business Development Officer for the City of Greater Sudbury’s Economic Development office, focused on the Tourism sector says, “What is the one thing all tourists have in common? They have to eat. Let’s explore how we ensure they experience Sudbury authentic taste of place.” Greater Sudbury’s Culinary Tourism Strategy, being developed in partnership with Ontario-based Culinary Tourism Alliance, is due to launch in late March, 2018. Pop-Up Markets bring fresh produce to neighbourhoods that lack an accessible grocery store. Heather Peters from the Good Food Box Pop-Up Markets informed the audience about the not-for-profit roving Market program that provides fresh fruit and veggies at cost in neighbourhoods that lack an accessible grocery store. The program started in June 2017 and was so successful it continued for an extra month, through to the end of September. FoodRescue.ca is a new program to Greater Sudbury which aims to re-direct food to charitable programs, saving it from the landfill. Victoria Armit is the Food Donor & Community Relations Coordinator for Foodrescue.ca in the Sudbury Region. She introduced the program and welcomed attendees to sign up at Foodrescue.ca if their organization may have extra food to donate to those in need. Leigh Anne Ceccetto spoke about Cultivate Your Neighbourhood, a school-based gardening program. Cultivate Your Neighbourhood is a relatively new program in Greater Sudbury, dedicated to engaging the youth in our school systems through community gardening based initiatives. Leigh Anne is currently preparing for another season of engaging youth through Cultivate Your Neighbourhood, and also at the BURST Youth Leadership Camp. Cultivate Your Neighbourhood gets school kids growing veggies! Locally sourced catering for Four Minute Foodies 2018 was provided by the Motley Kitchen, featuring local kale, chicken, sausage, beef, potatoes, beets and maple syrup. Categories: Uncategorized | Tags: Four Minute Foodies | Permalink. The Greater Sudbury Food Policy Council is hosting the fourth-annual Four Minute Foodies event on Wednesday, February 14th in Board Rooms C and D of the Provincial Building at Tom Davies Square, from 12 to 1 pm. This event comes on the heels of the Greater Sudbury Food Strategy launch, and features several Sudburians who are making a difference to the way food is grown, distributed, consumed and recovered in Greater Sudbury. Do you want to help improve Greater Sudbury’s Food System? Want to take some simple actions to support our local economy and our citizens? Complete the TAKING ACTION Pledge and let us know what you are doing to build a better food system in Sudbury, Ontario.